Welcome to Light On Light Through, Episode 102, in which I interview John Glenn, first American to orbit the Earth, about what he sees as a constructive intersection of space travel and religion. The interview was conducted on July 30, 2015 in Senator Glenn's office at the John Glenn College of Public Affairs at Ohio State University in Columbus, Ohio. A transcript of this conversation will be published in the Touching the Face of the Cosmos anthology being assembled by Michael Waltemathe and me - more details about that, including the contents, here. We also discussed John Glenn's response to portrayals of him in the media, and other aspects of his life as an astronaut. *Note added December 17, 2015: the anthology has been published, and is here available here. In addition to John Glenn, his wife Annie of 72 years participates in the conversation. Adam Sackowitz joins in the questioning. In addition to John and Annie Glenn, I thank Joel Iskowitz, Adam Sackowitz, Peter Bucher, Kathy Dancey, and Fordham University, for each helping in their own ways to make this interview possible. 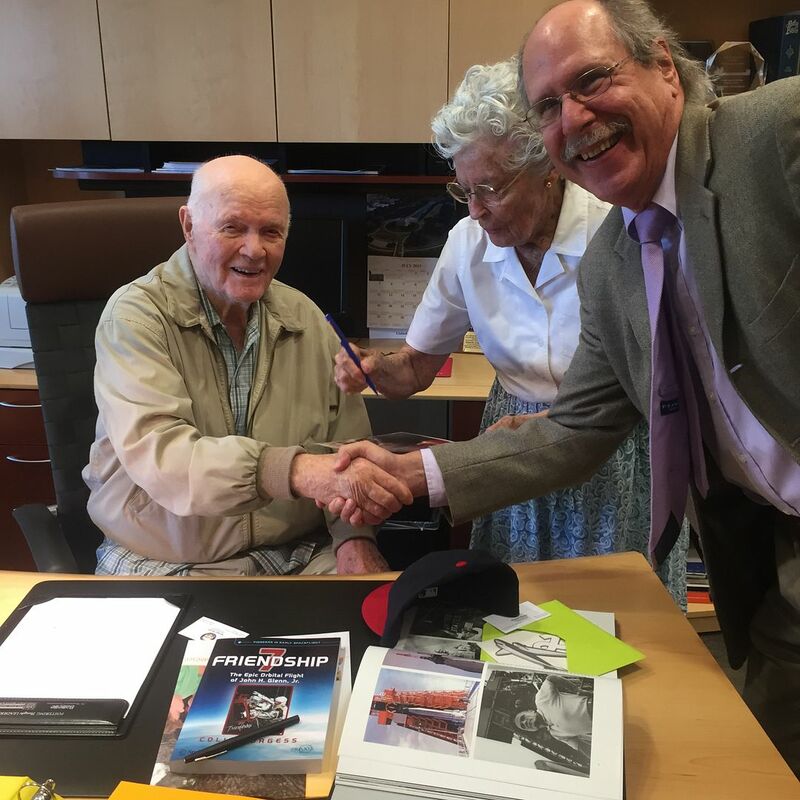 The photo below of John Glenn, Annie Glenn, and me was taken at the end of the interview. Enjoyed the podcast very much, Paul. Thanks for sending it to me and well done to all concerned! I wonder if any of the former astronauts have come across my Apollo books. I attempted to send copies of the latest one to Buzz Aldrin and Jim Lovell, but not sure if I was successful. Many statements in that book from the astronauts during the 60s and 70s, as well as political leaders indicate that not only was there hope, but there was the full expectation that we would have continued manned space exploration, even achieving a manned landing on Mars by the year 2000. How disappointing that it didn't work out that way. Keep up the very good work you are doing, Paul!